By Tsukihime, May 28, 2012 in Completed Scripts/Plugins/etc. This script gives your parameters individual levels to specify their growth. Different actors have different growth rates for each stat, and have a random chance of leveling that stat when their own level increases. Stats with a high growth rate will have a higher chance of leveling, while stats with low growth rate will rarely level, and thus rarely increase. Where n is an integer between 0 and 100. If you would like the growth rates to apply based on class, just tag the class instead. Actor growth rates take priority over class growth rates. It looks like this is just what I needed. Thank you very much. I've been waiting for something like this for a very long time! Testing the script a bit, it seems to work fine. 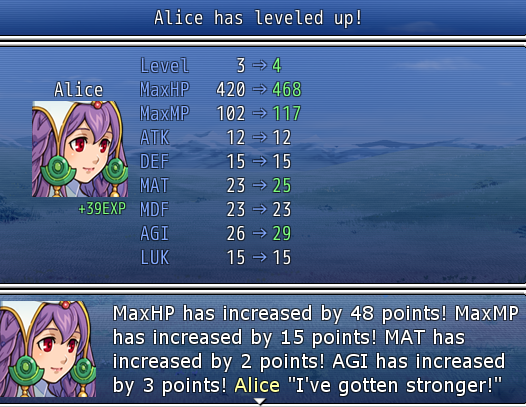 I gave Eric high growths in HP, ATK, and DEF, but low growths in MP, MAT, MDF, AGI, and LUK. 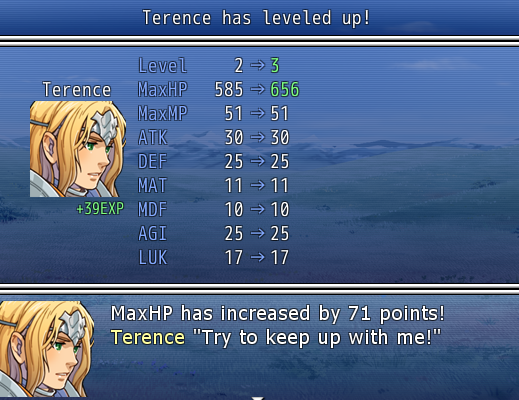 Upon a level up, he grew in HP and ATK. Is there a way to make the text upon a level up not show? I want to make it compatible with Victory Aftermath. 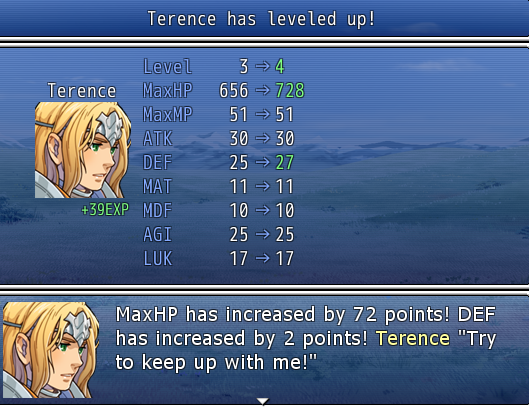 It still works with Victory Aftermath, but upon a level up, seeing the actor's line and the level up text together is a bit jarring. Other than that, amazing job. I've updated the script with a configuration option to turn it off near the top. Okay, that fixed the problem. I'll report anything else if I see it, but it seems everything's sterling. Do you mean that if I have applied growth rates on actor and class, the actor will overwrite the grow rates of the class? Is it possible for it to work together? because i have a change job script and i want to have the growth rate of the actor to be random and then the growth rate of the class to be custom. So it cant be stacked? average sum means class hp + actor hp / 2 right? T_T and i will have to set every growth rate. If you want it to stack then it really depends how you want it to stack. In the end you still have to set every growth rate, otherwise they'll be the default and look bad. So does that it could stacked with the current script? is it also possible for it not to be random but with a customization? for example atk will increate by 5 every level and then it will increase by 15 every 5 levels? I can modify it to stack actors and classes. Any customization would require you to go into the script and modify it to suit your needs. I don't think I can write a generic script that will support every possible growth rate. Well, now they stack. Not sure how I would write it to allow all sorts of customization though. I think something's wrong with the calculations now. When I set actor/class stacking to false, characters get really bad stat growths. But when I set the script to stacking, even when I haven't added any growth notetags to classes, the stat gains are still ridiculously high. Like, characters were gaining in almost every single stat in almost every level. It might just be some really weird coincidences, but it's happened often enough that I'm suspicious. Can you make sure that the stacking hasn't changed any of the calculations? That's the problem I mentioned with stacking. By default, all of the growth rates are 100% = normal. This allows you to leave agi empty for actor and class, and so the average is (100 + 100) / 2 = 100% = normal. When they don't stack, it just grabs whichever one you specified. When they do stack, I take the average of the two, which means if you don't specify class growth rates, those are all adding 100 to your growth rate. So if your actor had 50% HP growth and didn't set anything for class, then it's still (50 + 100) / 2 = 75% growth. It wouldn't be too hard to change it so that if something's set on one but the other is empty, it just uses the one that's set by itself. If Tsuki won't do this, I'm sure I can modify it to do that for you. I'll wait for his feedback first though, because there's little point me making a modification if he's willing to add that as an official option. ^ If Tsukhime isn't interested in making such a modification, I'd love if you would do so. You can add it. I'm still not sure whether it would make sense to implement such an option because if you're not going to stack anyways, what would be the point of enabling growth stack? Might as well just leave it off if you want one or the other. ^ The thing is, I think the stacking is screwing the calculations up even when it's set to false. 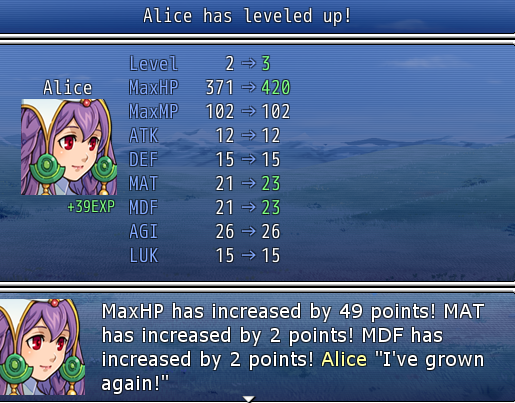 I set it to false, and now characters are getting really bad stat growths, only growing in about three stats per level up even when their growths are high. Probably just really bad luck. At this point, I doubt it. Here are some screenshots from three levels. 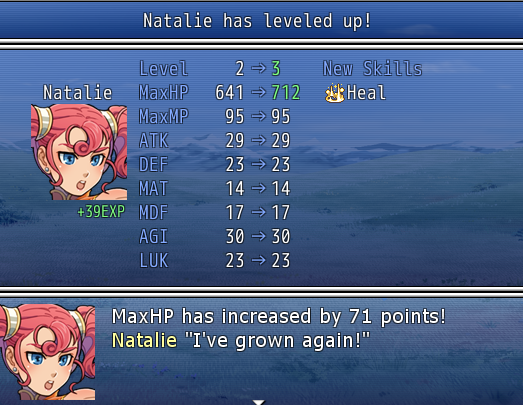 Note that I set the HP growth to 100. 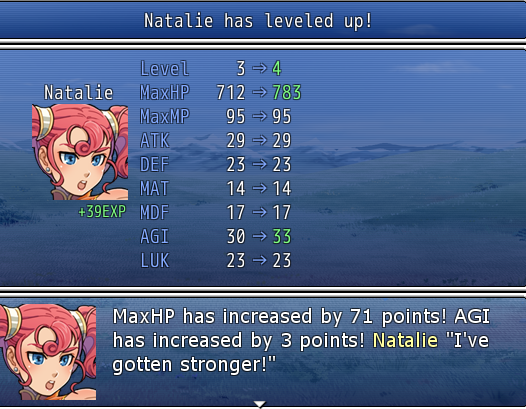 I also leveled them up to level 3, with the same sort of results, but I didn't feel like taking your screenshots. Maybe you're right and I'm just having an incredibly long streak of bad luck, but these growths are by no means low. Statistics state one of them should have gotten a good level in about the ten times I tested them. 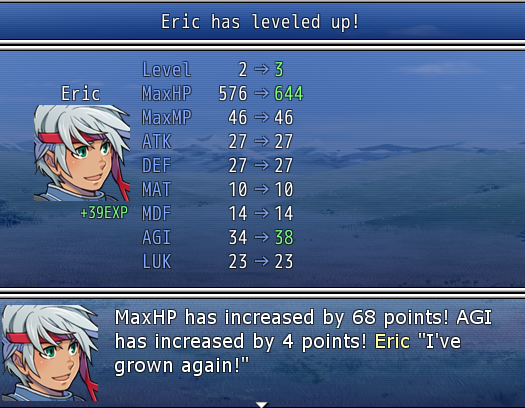 Interesting, when I did 10 level-ups, eric got atk/def/agi almost everytime. This is with growth stack disabled. Well, I used a pretty simple formula to determine whether you get the stat or not, and I'm not sure how reliable the random number generator is. ^ It seemed to work pretty well before. Sorry for the double post, but I redownloaded the script. The growths seem to be working normally now. Maybe I just copied it wrong?